that would create .DFF files (actually .DEF files, but without the "Date", "Time"
on the "Ok" button of DbBuilder every time it 'hit' a missing datafile. so have released it into the Public Domain. 3.x filelists. It does NOT appear to work when using a DF2.3x filelist. 1. 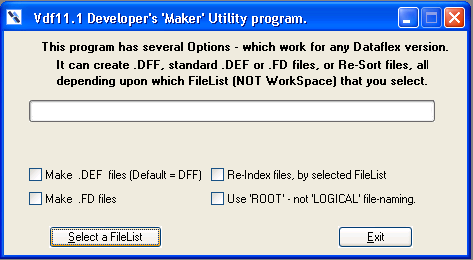 Create a Directory named "Maker"
3. Register the Maker.Ws file. 4. Re-compile - if you wish. 5. Add a ShortCut to your Desktop to easily run this program in future. in the "WorkSpaces" Tab of the Vdf11.x "Configure Environment" option of the IDE. action per FileList selection - which is why I currently enforce this behaviour. Not a real problem, but one I will track down when I get the time. Anders Ohrt - DefGenerator and DefGenerator_Helpers - included. Sture Anderson - Vdfquery23 system required to compile - not included. It can be obtained from DAW's FTP site. Wil van Antwerpen - Assisted with suggestions and debugging.